First, the eight locking 'fingers' pressing on the corners of the identical gold–platinum cubes were retracted on 3 February. The cubes were then being held in position only by two rods, softly pushing on opposite faces. "This is a historic achievement: we are demonstrating the most precise freefall that has ever been obtained in space," says Paul McNamara, LISA Pathfinder Project Scientist. On 23 February, the spacecraft's main operating mode was switched on for the first time. With the test masses in freefall, all of the key elements are now in place to start LISA Pathfinder's scientific mission on 1 March, following some final tests on the fully operational payload in the coming days. 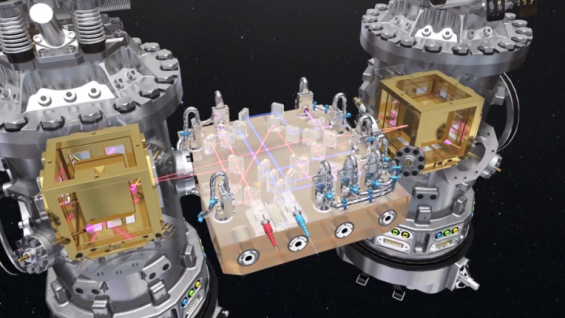 A spaceborne gravitational wave observatory was identified as the goal for the L3 mission in ESA's Cosmic Vision programme, and LISA Pathfinder will lay the foundations for these future investigations of the gravitational Universe. "It is an immense reward to see this pioneering spacecraft ready to start its crucial mission," concludes César García Marirrodriga, ESA's Project Manager.